(NEW ALBANY, Ind. 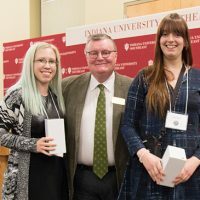 )—The 2018 IU Southeast Student Conference concluded on Friday, April 20 with a luncheon and awards ceremony to recognize outstanding undergraduate and graduate research across all academic disciplines. 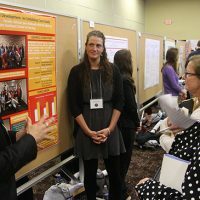 This year, the conference boasted a record number of students displaying 114 posters and presenting 110 papers and performances. There were 62 faculty mentors and 70 judges. The winners of awards are listed below, though it is important to note that everyone involved in or touched by this event—including students, their families, faculty sponsors, volunteers and the campus itself—is a winner. 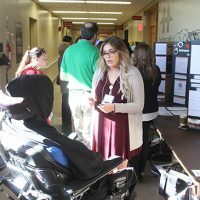 The IU Southeast Student Conference is the largest of its kind in the IU system, and touches just about every office and individual on campus. As in years past, students in the Honors Freshman Seminar, psychology and natural sciences also contributed to the success of the event. They stuffed conference bags, staffed the conference registration table, moderated the poster and oral presentation sessions and helped to set up the awards ceremony. 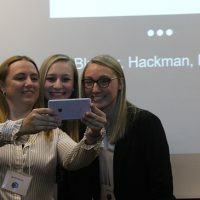 The conference was also enlivened once again by visitors from area secondary schools, this year with 83 students from Jeffersonville High School, New Washington High School, Charlestown High School, and Pleasure Ridge Park High School. Besides taking in oral and poster presentations, the students received a campus tour with information about admissions processes and school facilities, visited the Ogle Center, Meadow Lodge and the Athletic Center. “The visit provides an opportunity to show the students first-hand some of the opportunities that could be available to them here at IU Southeast,” said Christopher Morris, admissions counselor. 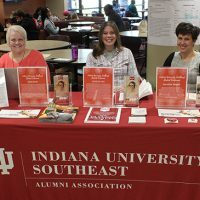 Amid the traditions, a novelty: the IU Southeast Alumni Association table staffed by prominent graduates and conference veterans, Jade Bilyeu, Anita Kraft and Jennifer Mason. For Mason, who graduated in 2012 with a B.A. in English and who will graduate in May with a Masters in Interdisciplinary Studies, the conference has been a proving ground for academic and professional skills. 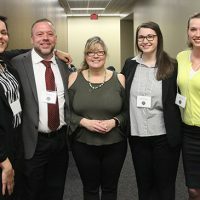 “The student conference gave me a forum beyond the classroom that made my research seem important and relevant to a broader audience,” Mason said. As co-owner of Southern Indiana Abstract Company, Inc., a real estate title research and technology firm, and an incoming adjunct instructor in English at IU Southeast, Mason has seen the benefit of the conference in her career. At the luncheon and awards gathering, two outstanding IU Southeast faculty members shared their own experience of winding roads of research that can lead from modest beginnings to significant accomplishments. Babb recounted his own journey into the academic realm, and of the expansion of opportunity and impact this has enabled him to enjoy. 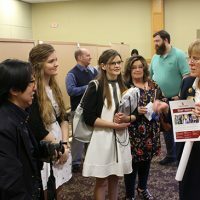 In his remarks to the gathering, IU Southeast Chancellor Dr. Ray Wallace emphasized the value that students may derive from participating in the conference, including the months of intensive immersion in subject matter that preceded it. Wallace reinforced the point that the skills developed in preparing conference presentations travel well: employers and other professionals take note that students with research backgrounds can already perform these tasks at a high level, and can also successfully work as part of a team. For Wallace, this means that everyone involved has already enjoyed the inherent reward of a job well done. “You’re all winners in my book,” Wallace said. Below is a gallery of impressions from the 2017 conference. Please click on the thumbnails for full-size images. 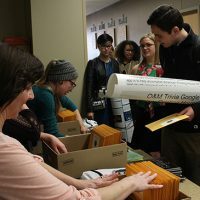 Teresa Andrews (l), assistant to the Executive Vice Chancellor for Academic Affairs, helps a team of volunteers register conference presenters. Diane Wille (r), dean of research, spent a busy few days juggling everything from banners and posters to requests for directions. 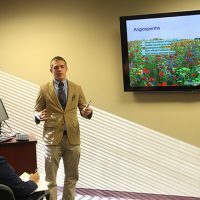 Presentations began at 8:30, with presenters such as biology major Joseph Borotka leading off a full morning of oral presentations in eight different rooms. 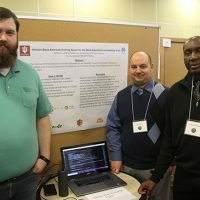 Computer science students Eric Schulze (l), Ryan Gosling (c) and LaRome Dickerson (r) won the Social Sciences Award for Community or Civic Engagement for their presentation on the uses of a trivia game to promote orientation and mobility skills for visually impaired students. 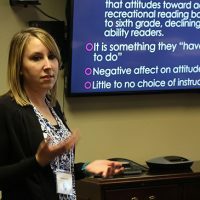 Brittany Becht, a graduate student pursuing a Master of Science in Elementary Education degree, presents on the ways in which students’ choice of texts affects reading achievement and attitudes toward reading. Becht’s presentation won the Chancellor’s Award for Creative Achievement. The conference gives students the chance to share their academic interests and research passions with fellow students. Nursing students Adam Snyder and Michala Beasley present their findings from their unfolding case study on human development to conference judges. The conference is a special moment in a student’s university career, with bonds formed through a common purpose. Dr. Lisa Russell (c), assistant professor of strategic management and entrepreneurship, celebrates a successful oral presentation with (from l) students Hillary Hoffman, Ethan Wood, Rebekah Knittle, and Sydney Pelkey. The conference highlights the support of faculty mentors for their student researchers. 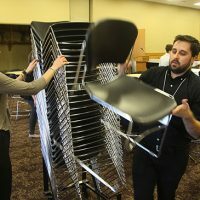 All hands on deck as students help to transform the Hoosier Room from presentation space to banquet hall. Conference veterans Anita Kraft (l), Jade Bilyeu (c) and Jennifer Mason (r) stoke interest in the Alumni Association. Chancellor Wallace presents the award for Outstanding Poster Presentation in Natural Sciences to Lindsey Freiberger (l) and Meeta Chesler (r), for their presentation on chemical modelling of Arctic ozone depletion over the Arctic Ocean, an important contribution to understanding climate.